Inspired after trying to pronounce the ingredients on my store-bought loaf of 100% whole-wheat “bread,” I transformed into my alter-ego, Betty Homemaker, and set out to make the perfect loaf of homemade bread. So far, I’ve made more than six delicious loaves, and flour dusts nearly every crevice of my kitchen. I’m exhausted. It’s much easier to buy a loaf of bread than bake your own. Thankfully, I had the perfect wine to go with healthy, home-baked (yet far-from-perfect) No-Knead Bread: A glass of buttery Chardonnay, of course. Mix ingredients in a bowl with a wooden spoon for 1 minute. Coat another bowl with olive oil, place dough in bowl, and cover with plastic wrap. Let rest for 12 hours at room temperature. Remove dough from bowl and fold over. Shape into a ball and let rest, seam down, on a cotton towel dusted with flour. Cover with another towel and let rise 1-2 hours, until doubled in size. Preheat oven to 450 degrees. Place a cast-iron or ceramic pot in oven for 30 minutes to preheat. Place dough in pot seam side up, cover with lid, and bake for 30 minutes. Remove lid and bake for an additional 15-30 minutes, until a deep golden brown. Bonterra Chardonnay is made with organically-grown grapes, though it can’t technically be called organic because it has sulfites, which help prevent oxidization and keep wine from turning to vinegar. Bonterra Chardonnay is smooth and creamy, like butter itself, with some juiciness to it—like a rich apple pie. Perhaps after I finish a glass (or two), I’ll be ready to proof some yeast and give it another go. Or maybe I’ll just head back to the bread aisle tomorrow. Diane Timba is a contributing writer at Thursday Happy Hour. Check out her lifestyle wine column here on Wednesdays. 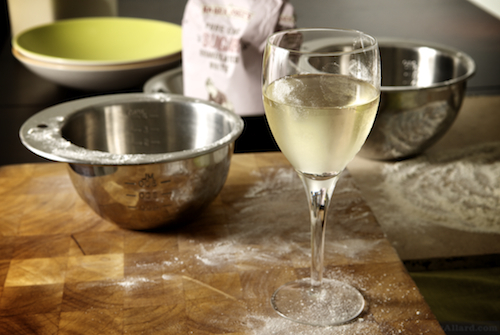 What wine do you drink while baking? Let Diane know in the comments below. Or chat with her on Facebook.